A list of Lighting available including Arri, KinoFlo, LiteMat, Litepanels, Mole Richardson, Joker, Dedo, LEDs and HMI's. The LiteMat 4 is an LED soft light that is less than an inch thick and weighs only 2.2 lbs. It has a lot of punch in a small package. If you ever dreamt of glowing foamcore..this is it. Dimmable, 3200K-6000K and flicker free. Comes with 3 choices of diffusion that velcros to the front. Joker 1600 - Not just another HMI. The Joker 1600 is the newest of the Joker generation of daylight fixtures. At 1600W, the Joker 1600 is comparable to over 6000W of quartz fixture output and produces twice as much, or one full stop more light, as our Joker 800. The Joker 1600 Bug-Lite has no optics. It's bare-bulb output is optimal for use in lightbanks and lanterns, creating perfectly even distribution within such accessories, eliminating hot spots and maximizing output. It can even be used pointing straight down. The Joker 1600 Beamer includes an 8” specular reflector and a set of 4 traditional PAR 64 lenses – Medium, Wide, Super-Wide and a Frosted Fresnel. These lenses provide varying light patterns from 5 to 45 degrees and a maximum output due to the reflector finish.The system is available with optional Octaplus 5 from Chimera. This Litepanels 3 light kit is perfect for traveling either by car or by plane. The flexibility, size, punch and power draw make this the ideal kit for travel because they can be ready for any surprise location. It includes 2-Bi Color Dimmable units and 1-Daylight Flood unit, 3 stands, gel kit and a Chimera. Plenty of room in the case for packing other items like stingers or grip. They can be rented as a kit or as single units. of soft light as a 2,000 Watt tungsten light, but only uses 1/10th as much power! The lamps are dimmable from 100% to 5% as well as switchable. Compared to the Diva-Lite, which uses the same four 55Watt compact lamps and the same ballast, the ParaBeam is twice as bright. The Chimera Lantern small and large are great for rigging over tables. Each gives a very even soft light. The adjustable skirt makes the source very controllable. With the Triolet, the Pancakes can be used with household bulbs, Mogul base lamps or “Studio Style” 2-pin lamps. They also fit our Joker 200,400,1600. Any wattage can be used up to 2000 watts. The Diva-Lite® 400 has become the industry’s most popular professional cool lighting fixture for location work. The Diva-Lite 400 portable softlights boast the company’s trademark modular fixture designs with full-range dimming, switching and remote control features. All Diva-Lites can go from nighttime to daytime interiors by switching True Match® tungsten for daylight quality lamps. It’s like having two set-ups in one! Like the original, LitePad HO is a slim profile light that creates a soft, even source of light. LitePad HO, high output, which is 33% brighter has a true daylight color temperature. Its small form factor and light weight make LitePad HO perfect for use in many locations where larger conventional lights simply cannot fit. A wide assortment of accessories such as dimmers, battery packs, mounting brackets and adaptors are available to help solve the individual needs of your project. 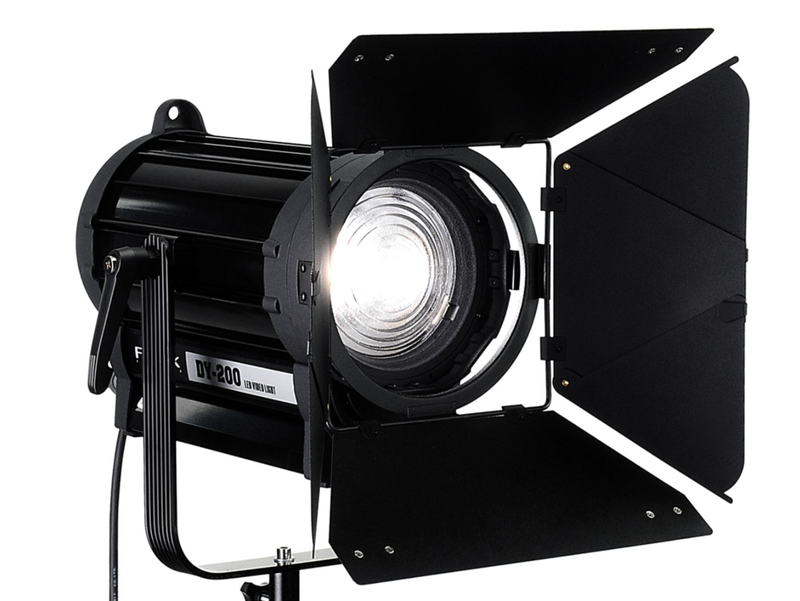 The VistaBeam 600 delivers the equivalent of a 4,000 Watt Softlight, but uses only nine Amps of power. VistaBeams also do a great job of illuminating interior and exterior sets with daylight quality light better than HMI’s punching through fabric diffusion boxes. The highly efficient reflector maximizes the light output and concentrates it where it is needed most. The center mount is ideal for location shooting and allows the fixture to spin 360 degrees to produce a wide range of desired beam angles. The compact Litepanels Mini fits easily on a camera, a stand or elsewhere. Flicker free, and heat free this kit is a great on-board light or a compliment to a full lighting package because of its size and battery power. This 2-light kit is dimmable, and comes with color correction gels and diffusions. The innovative design offers flexible use...hang it, stand it up or lay it down. It can be used with standard household bulbs or mogul base up to 500 watts. The newest lights from the Kino family. This 200 Barfly kit is very compact and very punchy. The kit comes with 2 head and tungsten and daylight lamps. The smallest of the Kino-Fl0 products. In Wisconsin, we do a lot of beer so these lights go great behind bottles, or any other place you need to hide a very small source. The PAR 64 lights are useful for simulating concert lighting and large washes for night exteriors. This light comes with a lightweight flicker free ballast, 50 foot head cable and stand. This is the new style Arrisun 12 Plus. It comes with 5 lens choices, 50 foot head cable and stand. This kit includes 1-1000watt open face with Chimera, 2-650watt fresnels, 1-300watt fresnel, 4 stands, wire, barn doors, pins and misc. gels. All in one case with wheels. The Barger-Lite has 6-1K lamps that all have their own switch. The light is used with a 3X4 foot Chimera. Each pair of lamps has a separate plug so this light can be plugged into house power. The Source 4 lights are great for throwing light across a set without spill. They are also great for quick backgrounds by using a soft focused pattern. This DC kit is perfect for night car interiors, or with the included adapters, it can be used anywhere with AC power. The kit includes 2-9inch units. This kit is the master kit, which means it comes with 4 fixtures. The Dedo light is a very compact, versatile and easy to use light. I have used them on both interviews and feature films. This is a 200/400 Combination Kit. It includes 1-200watt Joker Bug and 1-400watt Joker light. Each light comes with lenses, scrims and a Chimera. Kit includes 2-4 foot, 4 banks; 1-2 foot, 4 bank; 2 single tube harness kits; daylight and tungsten lamps.